If you’re reading this, you’re either a runner, an aspiring runner, or interested in running. If you’re an aspiring runner, all of the runners out there will surely agree with me when I say that running is freedom. 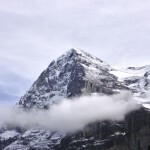 I met one of my friends at the Jungfrau Marathon this year, and I asked him how he’s doing after recovering from an injury. His answer was that he’s doing well and is happy that he’s allowed to run the marathon — not permission wise, but that he physically can run. Doing something you love, is freedom and one of the best things in life. Doing something you love for a great cause is even better. 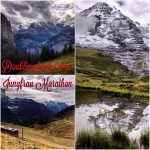 With that in mind my friend, AnneMarie, and I decided to run the Jungfrau Marathon for the charity organization Room to Read. The charity founded by former Microsoft Executive John Wood, has a fundraising arm named the Yak Pack. For a few years they’ve been running the Jungfrau Marathon to raise funds. 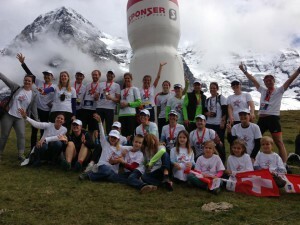 To raise funds for the Marathon, we organized the Swiss premiere of the documentary “The Perfect Runner” in July 2013. 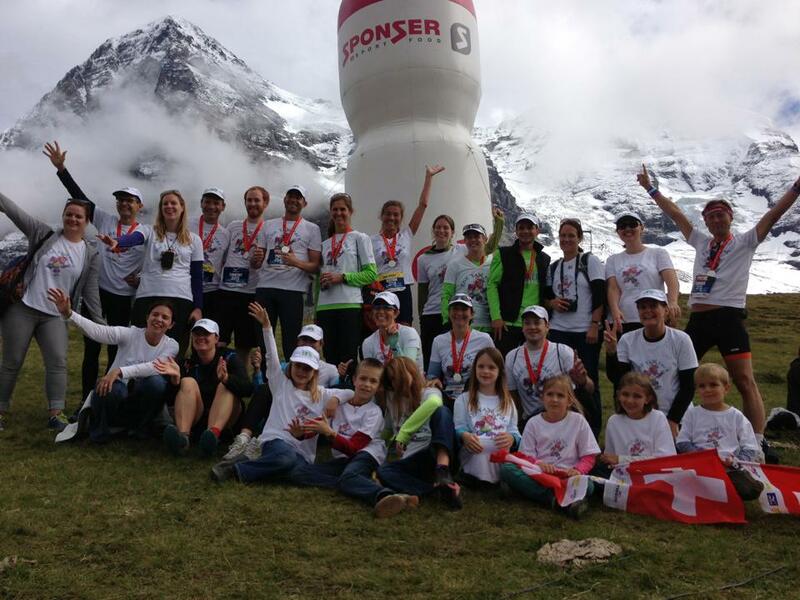 From this we were able to raise about CHF 2500 — enough to send 10 girls to school for one year. We also heard a story about the fundraising that went on last year. 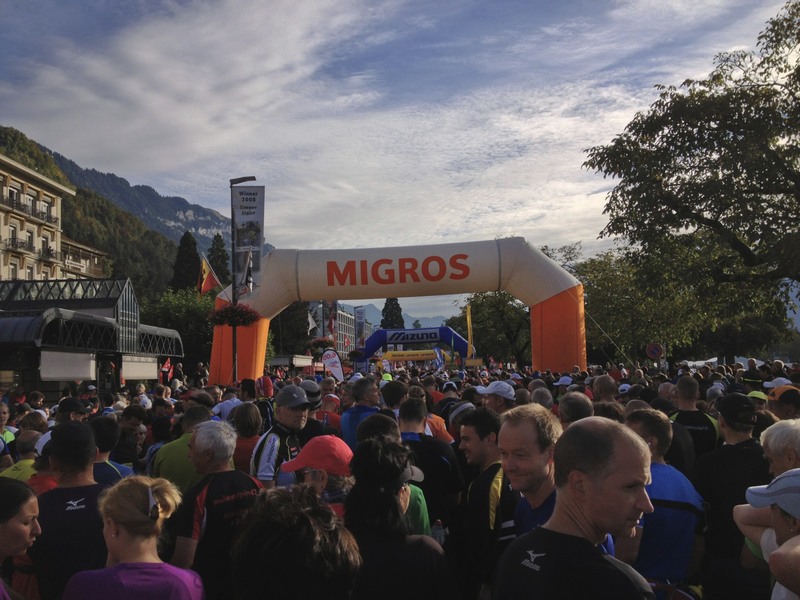 One of the Yak Pack runners approached a former employer and he offered something like CHF 2500 per kilometer. 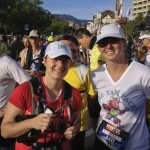 Shortly before the Marathon she called her former boss to ask if he was 100% serious about the donation of CHF 105 000. 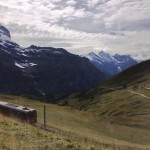 His answer was that he did not promise CHF 105 000, but CHF 2500 per kilometer. After taking a few minutes to think about it, she asked him: “So, if I were to run it twice…?” To which he answered CHF 2500 per kilometer. With that promise she and two others from the Yak Pack ran the Jungfrau Marathon up and down, and the generous sponsor made a donation of over CHF 200 000. The story impressed me, not just because of the sum that was donated, but also because of the dedication that the runners showed. That story made me decide to go for the double this year. I contacted the other Yak Pack members, a record number of 18 this year, to see if anyone else would go for it with me. I admit, I did this rather late and those who wanted to, were pushing themselves having just overcome injuries and needing to travel the next day. AnneMarie, however, said she would and we prepared. A week before the marathon the weather changed from summer to autumn and it started raining. All week, we were watching the weather reports to see what would await us on Saturday. From sun, to rain, to snow and back to sun, we had no idea. The fact that it had rained until Thursday made us believe that the trail would be rather wet. Saturday though. we awoke to a clearing sky and a comfortable 13 degrees. The meeting with the Yak Pack before the race, there was an atmosphere of excitement and anticipation. 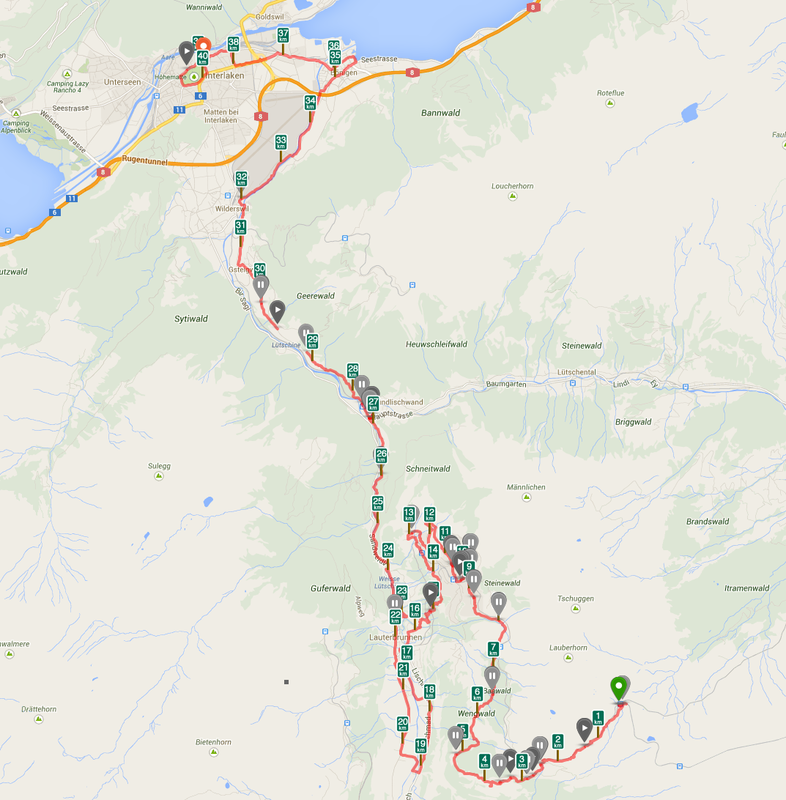 AnneMarie and I started far behind in the sector for people expecting to finish in 6 hours. With 4800 runners from around the world, it was not easy to start to make our way forward. 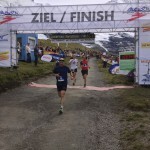 After Bönigen we parted ways as I went off chasing my personal goal of beating my personal best from last year of 4:59. The atmosphere, like in the past years was brilliant. There were crowds in the towns and people along the route. The refreshment stations had plenty of food and drink and were all well maned. Thanks to the series of ultra runs I’ve had the opportunity to run this year, the climbs were less challenging and I was able to pass the 5 hour pace runner. 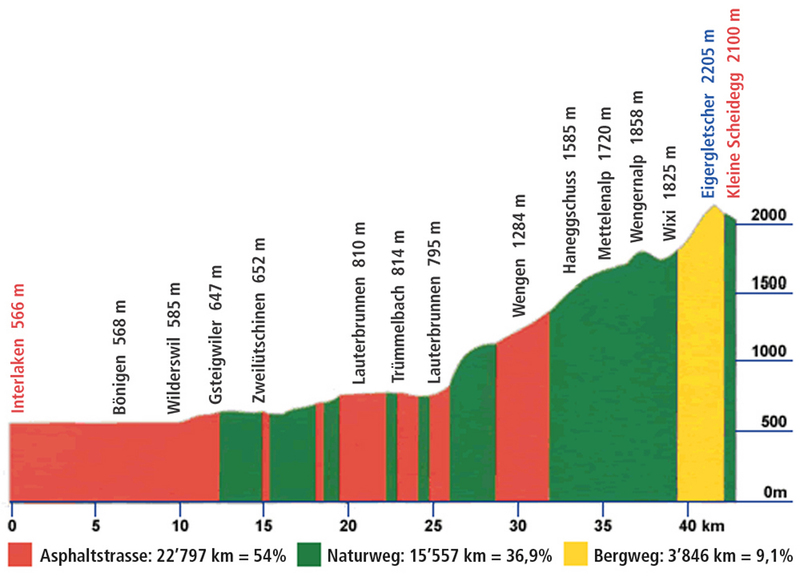 That said, the climb from Lauterbrunnen to Wengen was still challenging and slow. Shortly before Wixi I ran into Daniel Bates (aka Danik TavBuddy) on his way to the top. An Englishman, Daniel had never run in the mountains before and just started running a year ago. 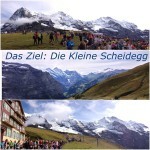 He was running the Jungfrau for the charity Scope. (Read his story here). 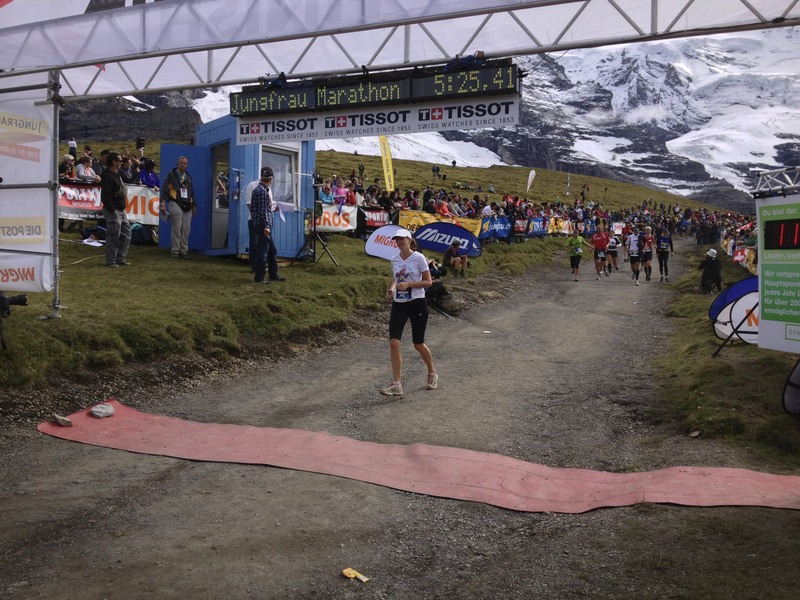 The final climb from Wixi up to the Eiger moraine though seemed easier and I had plenty of energy to really run down to the Kleine Scheidegg and cross the finish line in 4:46.03, a full 13 minutes faster than last year. Crossing the finish line and being greeted by the three Yak Pack members, who had already finished. With our Yak Pack t-shirts and the motto — “It’s just a hill, get over it.” We gradually collected and made ourselves noticeable. 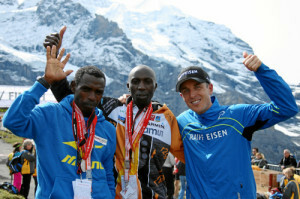 I also met Daniel again at the top, who finished in an amazing 4:54.22. If you’ve ever wondered why people run marathons, especially mountain marathons see this short clip of some people finishing. 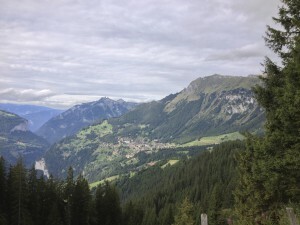 At 3:30 AnneMarie and I grabbed out packs, which had been transported to the top and headed back down towards Interlaken. 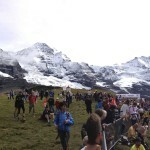 We avoided the Eiger Moraine because of the potential runners who may have still been on the course. We joined the course just after Wixi (before if you were going up). This run was fun because we got to run on single trails that had a gradual slope, so it was very comfortable to run on. 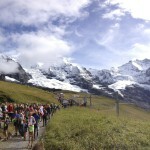 On the way we passed a few runners heading to Wengen, where they were staying. 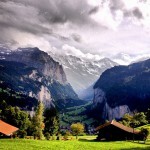 In Wengen we lost each other. 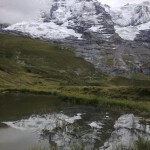 A German in Wengen asked me where I was headed as I went back to look for AnneMarie. 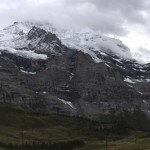 I told him I was going to Interlaken, and he shook his head like I was crazy. 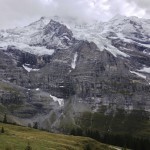 I had gone a little too far ahead and AnneMarie followed the signs to Lauterbrunnen, where went the upper way north to circle around and made up one kilometer from what we lost not doing the Eiger Moraine. At Gsteigwiler I went off the route, deciding to take a Wanderweg instead and add on a little more distance and not be on the road. Running on trail also feels better on the joints and there was still enough light that I didn’t need to put on my headlamp. 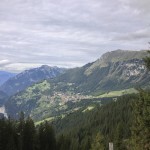 After Wilderswil, I then followed the Lütschine into Bönigen. 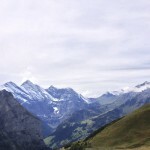 Turning at the Lake Brienz (Brienzersee) I hit my wall, I had hardly had anything to eat all day and was eating nuts and fruits in anticipation of a grand meal once I was finished. 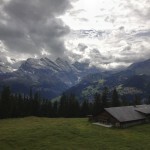 Now it was running alternating with walking back into Interlaken. Getting to the start line, I still needed to do a lap around the park and do the distance to Matten to get in the full 42KM. Finished, I was relieved and happy that I did it in between 4:30 and 4:45 (my phone died so did the tracker at 40.25KM and 4:21). I didn’t get the media coverage I wanted to get for Room to Read, but hopefully some of you readers will be inspired to make a donation. Donate to Room to Read here. 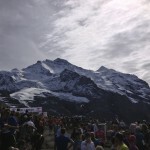 I think the Jungfrau Marathon is brilliantly organized, a beautiful route and has wonderful volunteers. Between Kleine Scheidegg and Lauterbrunnen the entire trail was spotless of debris despite the tens of thousands of paper cups that were used. 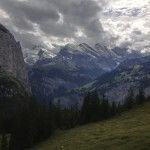 However, in Lauterbrunnen along the Weisse Lütschine I picked up several PowerBar and Sponsor wrappers. For this reason I would ask that if you are a runner running with any kind of wrapped food, especially gels, carry a little sack with you to take the wrappers away. Leaving them on the trail ruins the nature that gives us so much pleasure. To the manufacturers of these products, please switch to biodegradable wrappers like Mule Bar. And for event organizers please work to ensure that more environmentally friendly products are offered. Personally, I like real food — bread, fruits, vegetables, nuts, and cake more than any gel or artificial energy/protein bar. My recommendations go for Black Bear (Raw ingredients, simple, vegetarian, gluten free) and Mule Bar. 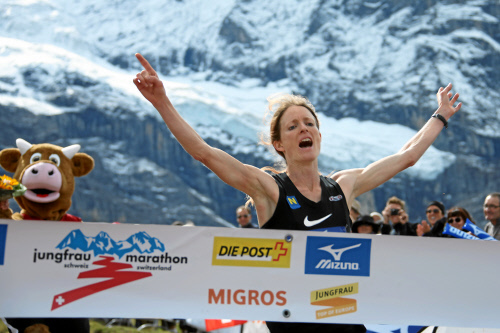 In case you missed it, the women’s record for the Jungfrau Marathon distance was broken this year and the best times in the men’s category were also some of the fastest for the marathon, though not breaking the records. 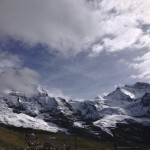 This entry was posted in Berner Oberland, Interlaken, Jungfrau, Jungfrau Marathon, Mountain Running, Race Report, Running Locations, Switzerland, Type of Run and tagged Berner Oberland, Eiger, jungfrau, Jungfrau Marathon, mönch, mountain running, On Running, room to read, Trail Running, yak pack by Christian Langenegger. Bookmark the permalink. Christian – Thanks so much for this great write-up. 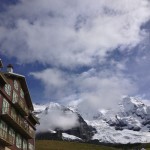 I am so glad that you made it back to Interlaken in one piece having bonked. 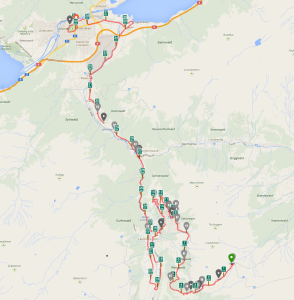 We also did a lot of walking towards the end, approaching our own start/finish line – no shame there after such a fantastic effort. 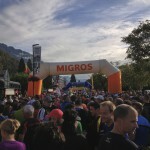 Look forward to running with you on some of our great Alpine trails next year! Congratulations on your tremendous roundtrip effort, Christian! Great fun to read your musings…and you’ve done an amazing job creating awareness for Room to Read’s work. 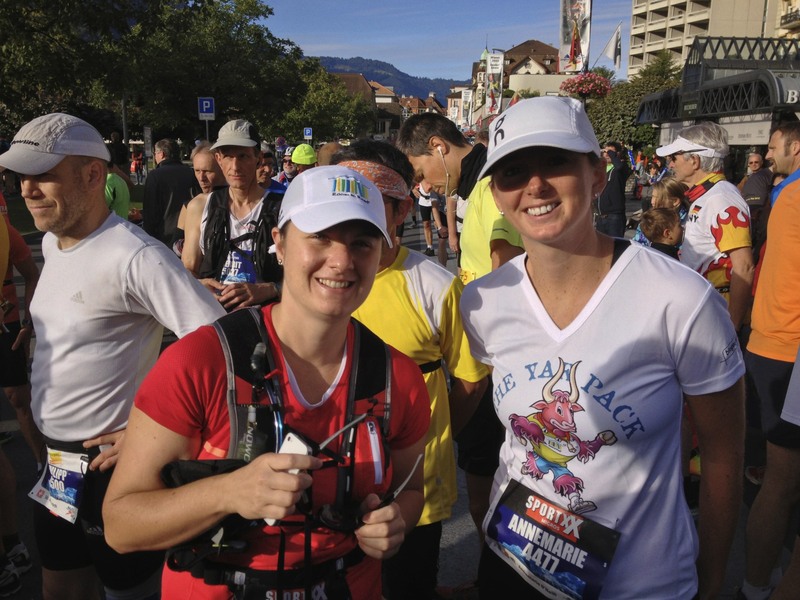 Glad to be part of the time with you and so many others – Go Team Yak Pack!